Whoa! The Thanksgiving jello salad keyword searches are bringing plenty of visitors here to Lelo in Nopo. So many last minute recipe searchers find themselves landing on these pages of my blog...my Grandma's jello salad recipes, a few recipes in detail, and even frog-eye salad. Oh the kitsch of it all makes me smile. But don't be fooled. I won't be making the Famous Holiday Cheese Salad this year. Bonus: photo of salad here. I've come to realize no one eats it. But you can listen to me wax eloquent about Jello salad, listen in on a chat I had with my mom, and I'm sharing some of your Thanksgiving horror stories on Lelo Homemade on Thanksgiving day. It will be airing Thursday, November 25th, 2:30-3pm (Pacific). To listen during that time go here. Otherwise, it will show up over at the iTunes site shortly. 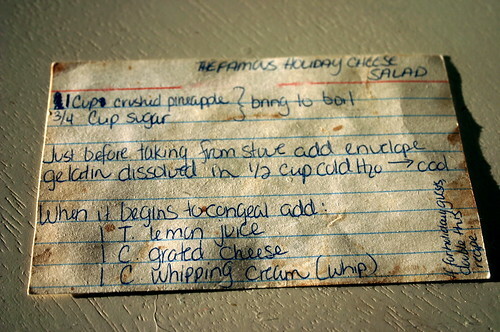 Man oh man, I remember my mom having a TON of those little index cards with recipes on them. Happy Thanksgiving! Seriously? Jello and cheese in the same dish? OMG!!! No one eats my grandma's cranberry jello salad either. So now I don't even bother to share! My mom had a beautiful and very labor-intensive jello dessert that was a rainbow of all the jello colors with a white cream cheese layer in between each color. It took hours, looked beautiful and tasted delish. I will need to pour through her recipes to see if it still exists. It's been decades since she's made it. thanks for the comment. happy fall holiday weekend !! we are skiing. www.snowbird.com. i highly recommend this resort. powder heaven. OMG...that is such a midwestern thing...every family gathering of my childhood contained at least one odd combination of jello and cheese/grated vegetable/canned fruit!